Paul Black has attended the new exhibition by New York-based artist Michael Joo, Radiohalo is a major solo exhibition of new artworks by the acclaimed conceptual artist. Joo works across a variety of media, incorporating themes of energy, nature, and technology, creating a complex and rich oeuvre, exploring identity and the body often by its absence or processes. Here Joo presents his new series of ‘caloric paintings’, and in doing so forms a conceptual dialectic with his earlier works, such as The Saltiness of Greatness (1992), in which the artist meticulously calculated the amount of energy that historical figures consumed during a lifetime. With this new body of work Joo gauges the number of calories individuals would expend performing various actions. Juxtaposing form, substance, and action to create his version of painting, in a way that only Michael Joo can. 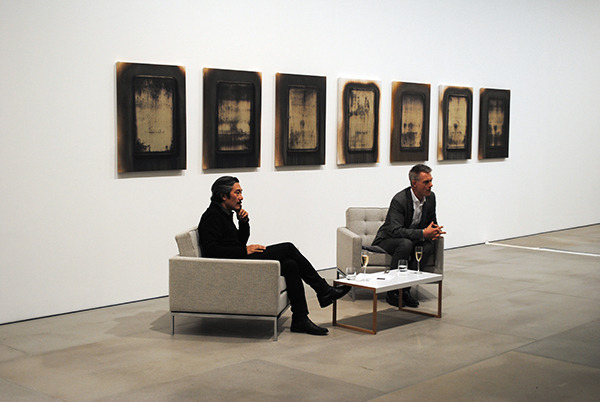 Image: Michael Joo (left) in conversation with Tim Marlow, Artistic Director of the Royal Academy of Arts. Photo: P A Black © Artlyst 2016. The artist combines the principles of painting, photography, print-making and sculpture, ‘seeding’ canvases with silver nitrate solution, creating works that are temporal in nature as the silver nitrate transforms over time, with caloric values being transferred to the canvases. The artist’s recurring methodologies investigate the meaning and value of the body and identity, and the viewer’s perception of the material used. Joo also adds a performative element to the works, the canvases serve as the result of an action mirroring the concern with caloric usage by the body in performing a process. The artist has a non-linear approach to his practice, juxtaposing aspects of science with art to create works that are often a documentation of a process. Joo’s work continues to evolve in a way that includes his physical presence in much the same way as the shamanistic German artist Joseph Beuys. 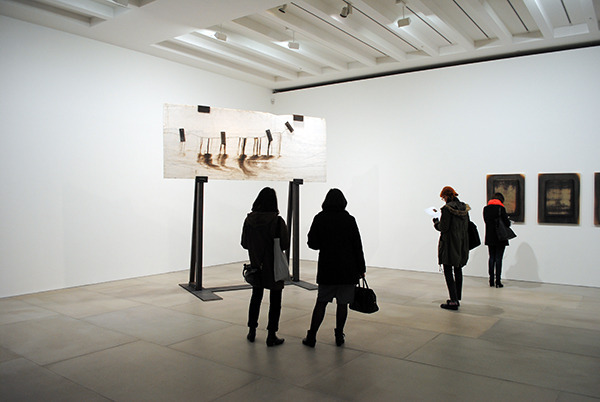 Beuys’ sculptures were in fact the artefacts of an action performed by the artist. In this sense the works defy a traditional category. Joo’s current works are simultaneously signifiers of a concept and the very artefacts of an action predicated by that concept. Image: Prologue (Montclair Danby Vein Cut) (2014-2015). Photo: P A Black © Artlyst 2016. Prologue (Montclair Danby Vein Cut) (2014-2015), is the largest sculptural work in the exhibition. The work continues joo’s fascination with Cameron’s Line, a tectonic boundary in the US defined by a subterranean belt of marble. The sculpture stands at 3 metres, consisting of a broken slab of marble elevated in a steel frame much like a billboard, and clamped back together, and treated with silver nitrate on one side. The piece is a signifier of the process of geological time as opposed to the fragile viewer who might stand beneath it, while the temporal journey of the material is reflected in the strata of the marble. Joo’s works emulate a closed system within a system, operating metaphysically and alchemically, speaking of temporality and the nature of human agency, explored through the artist’s series of endangered crane’s legs, performative sculptures created from graphite, with which Joo marked the walls of the lower gallery at Blain|Southern. The act and resulting forms suggest the fleeting physical existence of the endangered bird, again the temporal and performative are present in the work – the temporary body, the graphite suggesting the carbon of carbon-based life – and the influence of human beings’ socially constructed boundaries. Joo’s latest series of works feel like a departure for the artist, heading ever-more into the relationship between the performative and the artefact. Joo transforms the nature of the canvas, blurring definitions and confounding traditional expectations. The artist’s sophisticated practice continues to operate metaphysically, alchemically, poetically, and conceptually (not to mention, synthetically and politically), exploring the boundaries of human identity and body, and how it is given form and potential meaning via process, time, and action. Joo’s work remains a fascinating journey for the viewer. Michael Joo was born in 1966 in New York. He received his MFA from the Yale School of Art, Yale University, in 1991, after graduating with a BFA from Washington University, St Louis. In 2001 together with Do-Ho-Suh he represented South Korea at the 49th Venice Biennale and in 2006, he was awarded both the grand prize of the 6th Gwangju Biennale and the United States Artists Fellowship. This year he presented a monumental site-specific installation at Sharjah Biennial 12: The past, the present, the possible, Sharjah Art Foundation, Sharjah. His work is in numerous public and private collections, including FNAC, Paris; Guggenheim Museum, New York; Museum of Modern Art, New York; Samsung Centre for Art and Culture, Seoul and Whitney Museum of American Art, New York. Lead image: Radiohalo installation shot. Photo: P A Black © Artlyst 2016. Words: Paul Black, © P A Black 2016. Photos: P A Black © 2016. Michael Joo: Radiohalo – Blain|Southern – until 9 April 2016.